Recently, I was invited to attend a sharing session with Marie France Bodyline’s CEO Amy Quek Swee Li at Marie France KLCC outlet. The session was held to address the myths and misconceptions surrounding slimming centres and slimming treatments. The session with Amy Quek was interesting and beneficial as shared from her vast experience in the beauty and slimming industry. I was thrilled to learn that Amy Quek has been with Marie France since 1989. 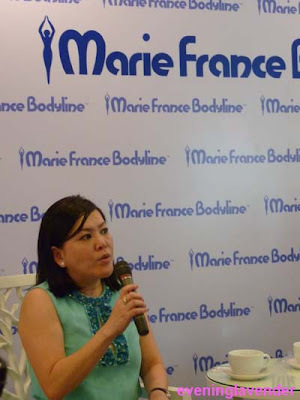 In 2012, she was appointed the first female CEO to helm Marie France Bodyline. 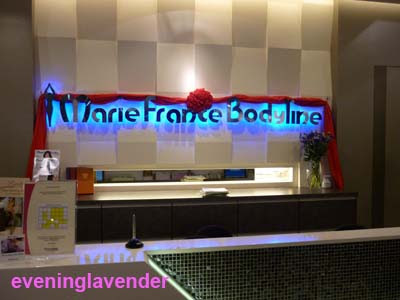 Marie France Bodyline has more than 20 years of experience in the slimming industry. 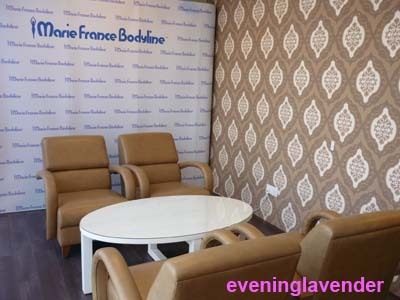 As the leader in slimming industry in Asia, Marie France Bodyline has a network of centres in Hong Kong, China, Singapore, Malaysia, Thailand, Indonesia, Macau and Brunei. 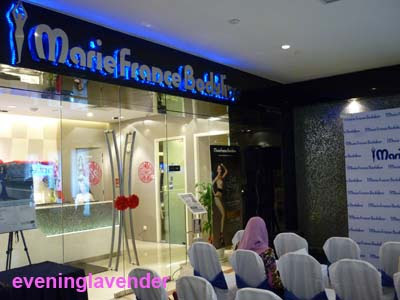 Today, there are 20 Marie France centres in Malaysia. Established in Switzerland, Marie France Bodyline conducts intensive research and development to address the common issues faced by today’s women such as excess fat tissue, cellulite and lack of skin elasticity. 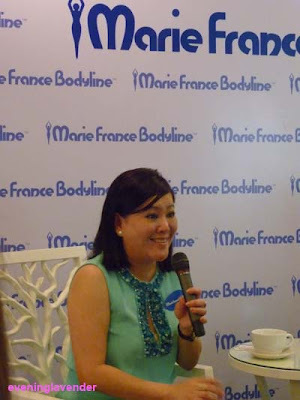 Amy explained that Marie France Bodyline constantly invests in state-of the-art technology and rigorous research to ensure that clients experience the best slimming solution. All equipments used are approved by FDA and other internationally recognized health authorities. Amy explained that the recent inventions by Marie France are Cellu Check PlusTM and Acoustic Radial Therapy (ART). Cellu Check PlusTM machine is able to analyse the fatty deposits in the body while Acoustic Radial Therapy (ART) is a method of combining high energy radial waves with a breakthrough vacuum technology to metabolise fat cells and reduce cellulite. The ART radial waves can penetrate the skin up to 35mm. Both the technology has been certified by the World Health Organisation (WHO) and has garnered much attention from medical professionals around the world. The Acoustic Radial Therapy (ART) is able to help women in battling with cellulite issues caused by hormonal and age related laxity of the connective tissues. The treatment is suitable to be administered to various parts of the body such as the arms, thighs, abdomen and love handles. Amy strongly believes that the consultants and therapists play very important roles in the client’s journey towards achieving the ideal body shape. The nutritionist in Marie France Bodyline will provide useful advice to clients so that they can follow a healthy diet and moderate exercise regime to aid in their weight loss goals. She stressed that the client can always consult the consultant for advice even after the treatment has been completed. Amy shared that in every slimming journey, it is important for the client to discuss realistic goals with the consultant and therapist. It is also important for the client to follow the advice of the consultant on how to eat healthily and do some simple exercises. 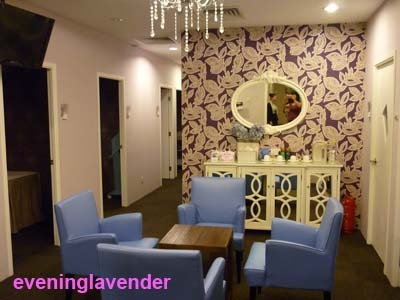 Clients must also visit the centre according to the agreed schedule so that the slimming goals can be achieved. I concluded that the quest to achieve a slimmer silhouette is not a one sided responsibility by the slimming centre. The client also plays an important role to ensure that the slimming goals are achieved. Amy further shared about the recent price transparency that is being practiced by Marie France Bodyline. She assured that clients will be informed about their packages and pricing upfront minus any hidden costs. As a firm believer of consumer rights, Amy stressed that it is important to be transparent in business. This is because clients will be confident and trust Marie France for their slimming packages. For more information on Marie France Bodyline products and services, you may log on to www.mariefrance.com.my or call 1-800-22-8222.